Get your feet ready for the next run with the OOFOS OOriginal Thong Sandals. These comfortable sandals are made with OOfoam™ which is 37% more resilient than EVA. That means that is cushions against impact better than almost any other sandal out there. If you spend long days on your feet, or you do a lot of running or walking, the OOFOS Sandals will help to rejuvenate your tired joints and muscles. The material is very durable and easy to clean, giving you the ultimate in convenience. "My regular size is 6. Should I order size 6 in you product?" "Yes these sandals, and most sandals run true to size, so I would recommend buying true to size." "Are these sandals waterproof? " "If you were asking about the Oofos Thong Sandals, I recently purchased a pair in Hawaii and the salesperson made it a point to tell me that they were great in water. She did say to wash them after being in salt water to prevent discoloration. I wore them all over in wet and dry conditions and they are great." "measured a flip flop that I have and measures exactly a size 7 in the oofos. I usually wear an 8 shoe. What size do you recommend? There would just be a 1/4 difference in length in the 8." "I'm not sure how you are comparing your sandal size, however, these do run true to size. I would recommend getting the size 8 unless you have tried them on and know for sure that you fit in a size 7 better. " "women's size 7 available in tangerine?" "Yes, there is a women's size 7 available in tangerine. " "Do you have any stores in the arlington ma area that sell this sandal?" "Unfortunately, we do not have any stores in Massachusetts. You can view all of our store locations and their contact information here!" "I have bad knees ! Bad back ! Had cortzone shoots in both knees I'm hairstylist for many years . What would be a good pair of sandals for me? Thank you!" "I would suggest taking a look at the Spenco Yumi Canvas Sandals (Women's) !" "How much do these sandals cost?" "The price varies depending on the color for these particular sandals. " "Thank you for your inquiry. 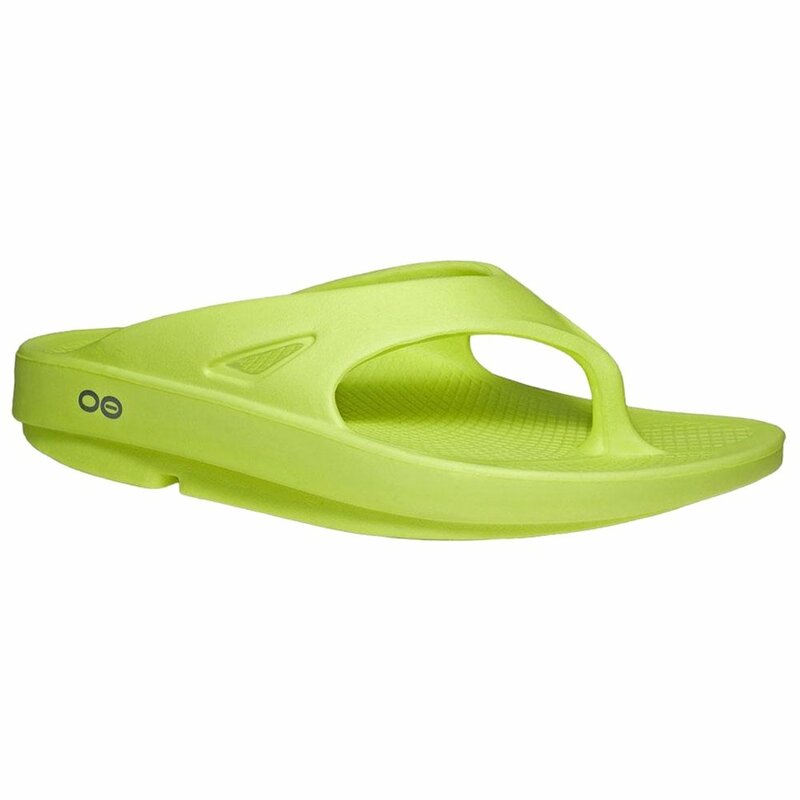 OOFOS Sandals are non-slip and waterproof. We hope this information helps!" "I wear an 8 1/2, should I order a 9? TIA"
"Thank you for your inquiry. We would recommend sizing up to a size 9. We hope this information helps! " "I need size W9 Can I order? Because in the page don't show this size." "Thank you for your inquiry. We currently do not have size W9 in stock. We recommend check back to our website periodically for any updates. We hope this information helps!" I just got my blue Oofos flips. I had ordered white, but apparently they were out of my size. I have only been wearing them less than a half hour, but I wanted to give first impressions. The flips have one feature that is unusual for molded flips like this, and that is that the straps are stretchable. I have slightly "puffy" feet, especially my right foot. It was a bit of a do getting the shoes on, but the straps are soft enough to where they are tight, but soft, and I am hoping they will stretch a bit. The flips are very soft, but not squishy. They have a good foot bed, and feel good against the skin. The rounded bottom tends to make the foot land just in front of the heel, instead of on the back of the heel. The arch is soft and pronounced. I have arches that are flattening out, and it is not uncomfortable. I ordered 9M/11w, and that is my size. The length is good and the size is good. The materials seems sturdy and the shoes appear to be good for the long haul. I would recommend them. My daughter-in-law loves hers. To me, they're squishy and sticky. I have a TON of sandals, but Oofos are my absolute favorite! I have fuchsia, orange, and black ones. Every year, I treat myself to a new pair/color. I thought I was just purchasing a nice thong for summer, but was very surprised that they had a great arch support. You can't see this arch support feature until you put them on! These sandals are THE BOMB!!! These sandals are so comfy, and so practical! My friend got both sandals and clog-style for his high arches and plantarfasciaitis, and raved about them. I tried them on, and did not want to give them back! So I got some! I have only worn them a few times, but I can tell this was an excellent choice. Feels like ur walking on clouds!! Best shoes for hurt feet! So far I wear these sand also in my home. Can't wait to wear them at the beach. I love these. Like walking on a cloud! The most comfortable flip flops ever!! Feels like your feet are being massaged when you wear them! These shoes are so comfortable and come in many colors. My husband has back problems and wears his oofos all the time.